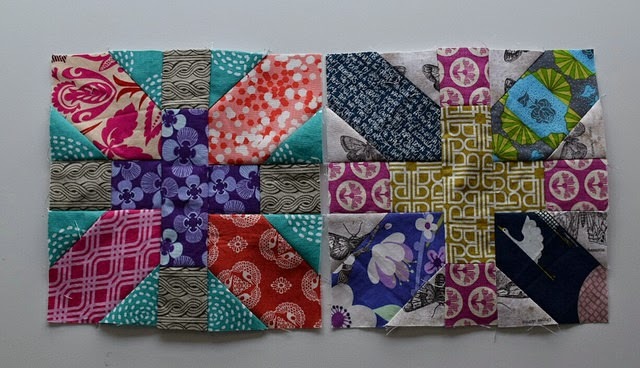 Square Quilt Along 2015. It's my favorite! finished the other 2 blocks provided. these blocks a very tropical feeling. both in them, and while sewing. the other to see if it's any better. *Spray starch is your BFF--Best Friend Forever! It makes lining up blocks SO much easier. I broke down to try it on my last of these blocks. I squared and trimmed my charm squares ahead of time. My solid was cut to 4 7/8", and I made my HST with it. seam on my 45 degree diagonals. each point met with another. See the Modern Tradition tutorials for pictures. past weekend, and has had so many neat link ups. her points, and then I saw the next pictures. dimensions, and the corner block. continue with wild abandon and glee. in the tutorial she links to at Bad Skirt Blog. next time around. They're mistakes worth sharing here. *Second, I am always under-gauging a 1/4" seam. on the topside and in the picture. What have you got lined up for the week? perhaps for St. Patty's Day? list of bloggers. I'm on Friday's line up. I love the yellow as the background in that latest HST block! It's not a color I would normally choose as a background color, but it works SO well with the bright prints you've used. It also sounds like you learned a ton about HST! My husband bought me BlocLoc rulers for Christmas, and they are SO worthy of all the hype they get. The yellow background is my fav. I enjoyed your post and seeing your precise points and lovely color combos. I usually undersew my 1/4" seamsalso, which can be a big problem. In your pinwheel star for the Modern Traditions QA, did you put the left bottom hst askew on purpose? I'll be darned! I didn't even see it! Thanks for the head's up, but I may leave it. 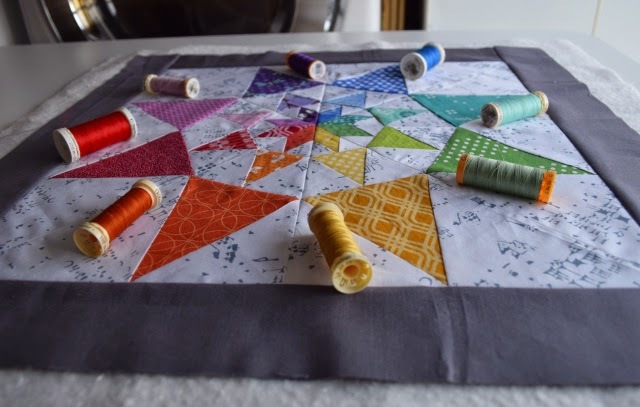 I like a quilt with one thing off, but perhaps not so obvious as that. So manny great blocks! Thanks for sharing with Oh Scrap! Looks beautiful and the yellow really adds a lot!